Bruinnie Bear Apiaries produces raw, local* HONEY. artisan HONEY SOAPS, natural BEESWAX-based LIP BALMS, HONEY STIXS, and other Products of the Hive. 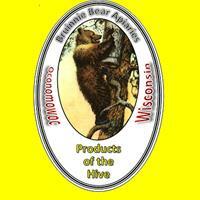 *Our honey is local to Western Waukesha and Jefferson Counties, Southern Wisconsin. We can also supply or direct you to purchases of bulk beeswax, propolis and pollen upon special arrangement. All prices EXCLUDE shipping to your address. Honey is available at most times throughout the year. Our honey is never heated or ultra-filtered. Honey prices fluctuate, so check frequently for current pricing. Matching Gift Boxes - $2.50 each. To approximate your total soap order, use the weight approx. on the Gallery page and multiply by $0.95. Flavors available: Amaretto, Apple, Banana Creme, Blackberry, Blueberry, Bubble Gum, Cherry, Chocolate, CranRaspberry, English Toffee, Grape, Key Lime, Kalua (Coffee), Lemon, Maple, Melon, Natural, Orange Creme, Peppermint, Pina Colada, Pneapple, Raspberry, Red Licorice, Sassafras (Root Beer Barrel), Spearmint, Strawberry Kiwi, Tangerine, Tropical Punch, Tutti-Fruiti, Watermelon and Wintergreen. Please Read This Before Ordering! You may use either, our Online Order Form or your own detailed email, describing what you would like to order. To use the Online Order Form: Please go to the Order Form tab at the top of this page. If you would rather assemble you order manually, simply send us an email (bbapiaries@att.net), detailing your order request. Your email should detail the items you'd like to purchase, the number of each item, and in the case of our artisan soaps, the fragrance you desire. We will send an invoice to your email address (Within one business day), detailing the cost of your items, any back-ordered items and the shipping cost to your address. To complete your order, all that will you will need to do is complete the instructions in the invoice. We offer access to all major credit cards through PayPal and PayPal Credit. We will then send an invoice to your address. We accept personal checks (w/a 15 day delay) and money orders (processed immediately) for the exact amount of your purchase. Please DO NOT send cash! Your order will be released for shipment when all payments are complete. We always use the most expediant and economical shipping method. As always, you may pickup your order at our farm and save on shipping fees. Hours by appointment only!